Cypress trees have been around for thousands of years. They typically live for hundreds of years. They Stand out among the trees of the planet for their size, longevity, beauty and resistance to water rot. Many specimens reach 100 feet in height, growing 24 inches in a single year, and have trunks with 20-foot diameters. Cypress trees have few insect or diseases problems and are tolerant of high winds and ice storms. Cypress trees are both deciduous and conifers. A conifer is a tree whose seed is a cone. Common cone-bearing trees like the spruce or pine are evergreens, meaning they do not lose their needles, which are their leaves. Deciduous trees are those that shed their leaves in the autumn, such as oaks, maples and fruit trees. Cypress trees have needles for leaves but shed them in the fall, making them deciduous conifers. Cypress trees are the only trees with knees. The knees are actually woody growths that sprout around the tree at a distance of several feet. The phenomenon occurs where cypress tree are standing in swampy conditions. While the purpose of the knees has yet to be discovered, the University of Florida reports that some scientists believe they occur in swampy areas only, because they supplement oxygen supplies to submerged root systems. Bald cypress trees are primarily found in and along water such as streams, rivers, swamps and lake shores. The pond cypress lives in and around still waters such as ponds provide. Both types of trees can be planted and will thrive in nearly any type of soil and do just as well away from water as they do near it. There 14 specimens of cypress tress found around the world but only three grow in the United States. The bald cypress is prevalent in the Atlantic and Gulf coastal plains spanning from Texas to Delaware and as far north as the southern tip of Illinois. 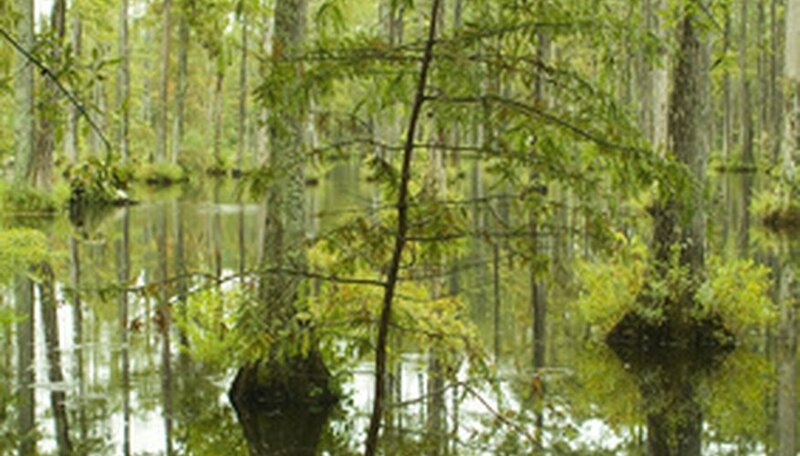 The pond cypress mirrors the bald cypress’s range with the exception that its northernmost reach is Virginia. The Montezuma cypress originated in Mexico and has spread along the Pacific coast. Cypress wood has been highly valued through the centuries. Its longevity and resistance to rot have made it a sought-after material. Giant canoes and water pipes were some of the things people constructed with it in the 1700s. Later, it was used to make roofing shingles, railroad ties, ladders, fence posts and siding for homes. Today, cypress is still harvested and more than 50 percent is used as lumber while about 47 percent is chipped and sold as mulch.